Chinstrap Penguins are one of the most easily identifiable penguins due to the thin black line that runs from ear to ear under their chin. It looks like a chinstrap, which is where their name originates. They are coloured blue-black on their back, white on their front, and their feathers are dense to act as insulation and provide waterproofing. They have red eyes and their bill is black in colour. They reach heights between 71 and 76 cms (28 - 30 inches) and they weigh between 3 and 4.5 Kgs (6.5 - 10 lbs). When swimming the can reach speeds of 32 km/hr (20 mph) and on land they often "toboggan" along on their stomachs, using their feet and flippers to propel themselves along. 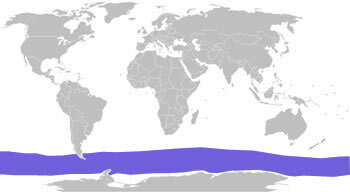 Chinstrap Penguins live in large colonies all around Antarctica, but mainly on the South Sandwich Islands. One colony is believed to contain 10 million individuals. They leave their colonies and move north of the pack ice for the winter months. 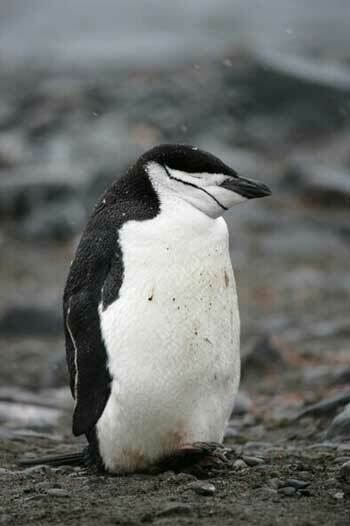 Chinstrap penguins mainly feed upon krill and small shoaling fish. They feed by diving for prey close to their colonies, each dive being less than 1 minute long and no more than 61 m (200 ft) in depth. They are considered to be near shore feeders, although they can occasionally be seen in the open sea. Chinstrap Penguins build their nests from stones and when complete they are approximately 40 cms (15.7 inches) in diameter and 15 cms (5.9 inches) in height. They lay two eggs which are incubated by both parents, they alternate every 5 - 10 days. After 5 - 6 weeks the eggs hatch but the chicks remain in the nest for a further 20 - 30 days before they join other young penguins in a creche. The young penguins are coloured grey on their back and white on their front. After 7 - 9 weeks, and after moulting and gaining their adult plumage, the young penguins venture out to sea. 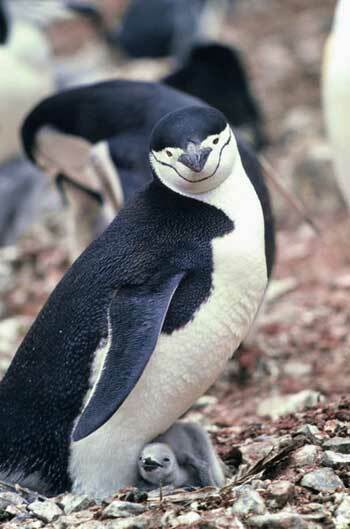 The main predator of Chinstrap Penguins are leopard seals. Eggs and chicks can fall prey to birds, such as sheathbills and the brown skua. There are no subspecies of the Chinstrap Penguin. 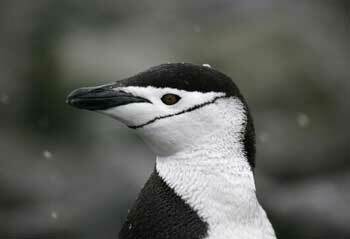 Chinstrap Penguins are one of the boldest and most aggressive species of penguin. There are approximately 7.5 million breeding pairs of Chinstrap Penguins.